The court granted defendant's motion for summary judgment that plaintiff's patent infringement claims were barred by equitable estoppel due to its ten-year delay in filing suit and found that defendant was materially prejudiced by plaintiff's silence following its cease-and-desist letter. "In the six years leading up to [plaintiff's] suit, [defendant's] marketing and investment efforts in [the accused product] yielded sales that nearly quadrupled its revenue. Rather than demonstrate that the investment was 'simply a business decision to capitalize on a market opportunity,' as [plaintiff] claims, these facts indicate more strongly that [plaintiff] saw a market opportunity to resuscitate its previously abandoned claims in order to capitalize on [defendant's] stronger revenues. After ten years of failing to follow up on its threat of infringement, [defendant] would be undeniably prejudiced if the Court allowed [plaintiff] to bring forth its claims only after [defendant] made substantial investments in its product." The court granted defendants' motion for summary judgment to limit plaintiff's damages for failing to mark its surgical products through its licensee's surgical guides. "Even though [the licensee] did not mark the licensed products or their packaging with [plaintiff's] patent number, [plaintiff] contends that the fact that [the licensee] listed the patent number in the surgical technique guides for these products as early as 2004 satisfies § 287(a)’s marking requirements. These guides are distributed to hospitals and at trade shows and are published on [the licensee's] website. Surgeons view and use the guides during the surgeries in which the device is used. . . . Because [plaintiff] has not established that the surgical technique guides were distributed or shipped with the licensed products, it cannot rely on the fact that these guides contain its patent number to show that it complied with the requirements of § 287(a)." The court granted defendants' motion to dismiss plaintiffs' second-filed declaratory relief action under the first-to-file rule even though the defendants' first-filed action was filed in an improper venue. "The plaintiffs . . . contend that the first-to-file rule is inapplicable because the Eastern District of Texas lacked venue, and therefore, lacked subject matter jurisdiction over the case. Improper venue does not strip a court of subject matter jurisdiction since Congress authorizes district courts to evaluate venue and to transfer a case in which venue is improper to a district where the case could have been brought. For this reason, improper venue in the first-filed court does not limit application of the first-to-file rule or alter this Court’s conclusion that the rule applies here." Following a jury verdict of $21 million, the court granted plaintiffs' motion for attorney fees under 35 U.S.C. § 285 because defendant's litigation conduct was exceptional. "⁠[T]here cannot be serious doubt that [defendant's] litigation strategies unnecessarily complicated the proceedings and needlessly increased costs. . . . At trial, [defendant] repeatedly argued claim construction positions -- that the Court had rejected -- to the jury, despite the Court’s admonitions not to do so. . . . [Defendant's] conduct was so egregious that the Court gave the jury a limiting instruction. . . . [Defendant] also seemed to purposefully ignore the Court’s orders in discovery. . . . Disclosing a completely unreasonable number of obviousness combinations in your contentions, waiting until opposing counsel objects, then supplementing them three weeks after the deadline with a reservation that you may still rely on the originally disclosed number of combinations serves no purpose other than to increase the litigation costs for both sides and the burden on the Court. It should be noted that none of Defendant's conduct in isolation makes this case exceptional. Considering [defendant's] litigation misconduct in sum, however, the Court finds that this case is exceptional and stands out in comparison to the mine-run of cases." The court granted plaintiff's motion for summary judgment that the asserted claims of its dietary supplement patent did not encompass unpatentable subject matter and found that the claims were not directed toward a natural phenomena. "Notwithstanding that the plain claim language refers to producing oxidized CoQ on an industrial scale, Defendants contend that the asserted claims are 'directed to' the natural phenomenon that certain microorganisms have the natural ability to produce at least 70 mole % reduced CoQ under standardized culturing conditions. . . . [T]he claims are 'directed to' a superior method of producing a certain end product -- in this case, efficiently creating oxidized CoQ on an industrial scale -- rather than to the inherent properties of certain biological materials. That the asserted claims rely on the ability of certain microorganisms to produce reduced CoQ at a ratio greater than 70 mole % among the entire coenzymes Q under standard culturing conditions does not indicate the claims are 'directed to' this phenomenon." Ordinary Observer Test for Design Patent Infringement Requires More than "Quick Glance" to Determine "Same Basic Shape"
The court granted defendants' motion for summary judgment of noninfringement of plaintiffs' vacuum cleaner design patents and rejected plaintiffs' argument that the ordinary observer test may be satisfied with a "quick glance" to determine "the same basic shape." "⁠[Plaintiffs' infringement expert] opined that when an ordinary observer is cognitively processing visual design, the process 'proceeds to a point where recognition takes place,' and '⁠[o]nce this happens, the ordinary observer does not (de facto) continue to view the product at greater levels of detail but simply confirms that the product matches the knowledge they have about a product and then moves on to the next visual or physical task.' According to this approach, 'when any design shape is perceived by the ordinary observer as a member of the [plaintiff's] patented category as determined by overall shape, the act of categorization may constitute baseline infringement. . . . The 'ordinary observer' assumed in [the expert's] analysis does not give the kind of attention to the designs that the Federal Circuit requires under the ordinary observer test. The ordinary observer must consider 'all of the ornamental features illustrated in the figures.' She cannot be assumed to simply take a quick glance at the two vacuums, conclude that they are the same basic shape, and stop looking. The ordinary observer is presumed to use more care in her evaluation." The court granted plaintiff's motion for pre-judgment interest and rejected defendant's argument that plaintiff was not entitled to any interest because the jury awarded design patent profits under 35 U.S.C. § 289. "Under 35 U.S.C. § 284, a patent owner may recover 'damages adequate to compensate for the infringement . . . together with interest and costs as fixed by the court.' Under 35 U.S.C. § 289, a patent owner may recover an infringer’s 'total profit' made from the infringement. In this case, the jury awarded [plaintiff] $3,018,174 under § 289, the 'total profit' from [defendant's] infringement of the Design Patent. According to [defendant], prejudgment interest is unavailable to [plaintiff] because it can only be recovered under § 284. [Defendant's] position is without legal support and at odds with cases that have applied prejudgment interest to patent infringement awards for total profit under 35 U.S.C. § 289." The court granted one defendant's alternative motion to transfer plaintiff's claims against it for improper venue and rejected plaintiff's attempt to establish pendent venue by asserting trademark claims in its amended complaint. "After the court requested supplemental briefing on where venue might be proper for the remaining defendants, [plaintiff] amended its complaint to add claims for federal and common-law trademark infringement. Based on those claims, [plaintiff] argues, the court should exercise pendent venue over all of [its] claims against [movant]. . . . Pendent venue is improper in this case. . . . The trademark infringement claims are to 'ferryboat in' venue for the underlying patent claim. 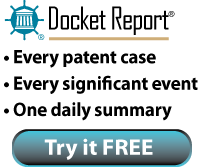 [Plaintiff] waited six months to amend its complaint, and it did so only after the court requested additional briefing on where venue might be proper for all defendants. . . . Because the primary claim is for patent infringement and the patent venue statute contains the more specific provisions, pendent venue is not justified in this case." The court denied defendant's motion to exclude the testimony of plaintiffs' damages expert regarding a reasonable royalty for failing to apportion damages on a claim-by-claim basis. "Plaintiffs [argue] that [the expert's] opinion is economically justified because he opines that infringing any of the asserted patents would 'have the same economic effect as infringing all of them.' In other words, Plaintiffs lose the same profit whether one patent claim in one patent is infringed, or whether multiple claims in multiple patents are infringed. . . . [T]o the extent that Defendant quarrels with certain factual assumptions made by [the expert] in failing to apportion damages on a claim-by-claim basis, those disputes go to the weight that his testimony should be given. . . . [His] reasonable royalty opinion need not be excluded simply because he did not apportion damages on a claim-by-claim basis." The court granted defendant Samsung's motion for an antisuit injunction prohibiting plaintiff Huawei from enforcing injunction orders issued by a Chinese court and found that the Chinese injunction orders would frustrate domestic policies. "⁠[Defendant] argues that allowing [plaintiffs] to enforce the Shenzhen Court’s injunction would frustrate specific domestic policies against injunctive relief on [standard essential patents] and general public policies against anticompetitive conduct and breaches of contract. The bulk of precedent supports its position. . . . There is a risk of inconsistent judgments if I were to find that [plaintiff] is not entitled to seek injunctive relief for its SEPs. In addition, in the absence of an antisuit injunction, [defendant] faces the risk of significant harm, not just in China, but with impacts percolating around the world. The Chinese injunctions would likely force it to accept [plaintiffs'] licensing terms, before any court has an opportunity to adjudicate the parties' breach of contract claims. Under these circumstances, the Shenzhen Order 'interfere[s] with 'equitable considerations' by compromising the court’s ability to reach a just result in the case before it free of external pressure on [Samsung] to enter into a 'holdup' settlement before the litigation is complete.'" The court denied in part plaintiff's motion in limine to exclude certain obviousness theories due to IPR estoppel. "⁠[F]or the combinations that Defendant tried to raise in the IPR, but which the PTAB did not institute, Defendant may pursue the combinations at trial. For those combinations 'A in view of B' on which the PTAB did not institute, I would regard that as reasonably raising 'B in view of A' also, and thus I reject Plaintiff's assertions to the contrary. On this point, Plaintiff's motion is denied." The court denied without prejudice defendant's motion to dismiss because plaintiff sufficiently pleaded that the asserted claims of its data organization patent encompassed patentable subject matter and that the claims did not lack an inventive concept. "Plaintiff contends that the [patent] solves a computer-specific problem by asking 'when a version should be deleted, not when it can be deleted.'. . . The statements in the specification, the allegations in the FAC and the language of Claim 8 . . . show that the FAC sufficiently alleges that deleting data in response to the combination of a particular time stamp and a measureable characteristic, 'thereby to increase a capacity of said memory' shows an inventive concept to the claims. Whether this recitation reflects a protectable, inventive concept is a question of fact." Following a $12.5 million jury verdict for infringement of plaintiff's water system disinfectant patent, the court granted defendants' alternative motion for remittitur, subject to plaintiff's acceptance of a $3.5 million award, because the verdict was excessive. "Instead of apportioning its royalty claim based on a reasonable estimate of the value of the claimed technology, as is required, Plaintiff based its damages theory on the value to [defendants] of all of the chlorine dioxide it created. This theory inflated the damages Plaintiff was entitled to recover, because it included the chlorine dioxide [defendants] created through the use of a non-infringing and prior art technique. . . . [B]y adjusting the parties’ respective proposals by considering their methodological shortcomings, it is possible to ascertain the 'maximum amount sustainable by the proof.'. . . Balancing these two competing proposals, and considering the trial evidence in light of the apportionment analysis, the Court concludes that a remittitur to $3.5 million is appropriate. " The court granted defendants' motion to dismiss because the asserted claims of plaintiff’s caller ID patent encompassed unpatentable subject matter and found that the claims were directed toward an abstract idea. "Plaintiff disputes that the purpose of the Claims is abstract. According to Plaintiff, the purpose is 'to indicate to a subscriber to both call waiting and caller ID, who is already engaged in a call, using an audible tone signal, the existence of an incoming call from a third party whose directory telephone number has been flagged private.' Even accepting this purpose as stated by Plaintiff, the Court finds it to be directed to an abstract idea. That the claims involve functionality of known telecommunications equipment does not detract from this finding." The court denied defendant's motion to dismiss on the ground that plaintiff’s signal processing patent encompassed unpatentable subject matter under In re Nuijten, 500 F.3d 1346 (Fed. Cir. 2007). "In Nuijten . . . the Federal Circuit held that transitory signals did not fall within one of the four categories of patentable subject matter and thus were patent ineligible. Defendant misses a key holding in Nuijten -- the Federal Circuit allowed processing claims and only denied patent eligibility for claims that covered the signals themselves. Here, Claims 5 and 18 describe the process of splitting and synthesizing signals. . . . Neither claim covers a signal, and thus, a Nuijten analysis is unnecessary." Following two inter partes review proceedings, the court granted plaintiff's motion for summary judgment that IPR estoppel under 35 U.S.C. 315(e)(2) barred defendants from asserting invalidity of previously instituted claims based on prior art that was known by defendants when they joined a third-party's IPR, but which defendant's failed to assert in that IPR. "When requesting joinder, Defendants did not raise any of the additional prior art patents and publications already identified in their invalidity contentions in this case. Defendants respond that because the 'PTAB routinely denies joinder if a second-filed petition might introduce new arguments or grounds into a pending IPR,' the only grounds that Defendants 'reasonably could have raised in the [third-party] IPR were the same grounds on which the PTAB already instituted the [third-party] IPR.' Contrary to Defendants’ arguments, there is no 'mirror image' rule for joinder. The PTAB has noted that requests for joinder can involve petitions that assert different grounds of invalidity. . . . Allowing Defendants to raise arguments here that they elected not to raise during the [third party] IPR would give them 'a second bite at the apple and allow [defendants] to reap the benefits of the IPR without the downside of meaningful estoppel.'. . . Accordingly, Defendants are statutorily estopped from arguing that the instituted claims of the [patent] are anticipated or obvious in light of prior art patents and publications discussed in their invalidity contentions." The court granted plaintiff's motion for over $7 million in attorney fees under 35 U.S.C. 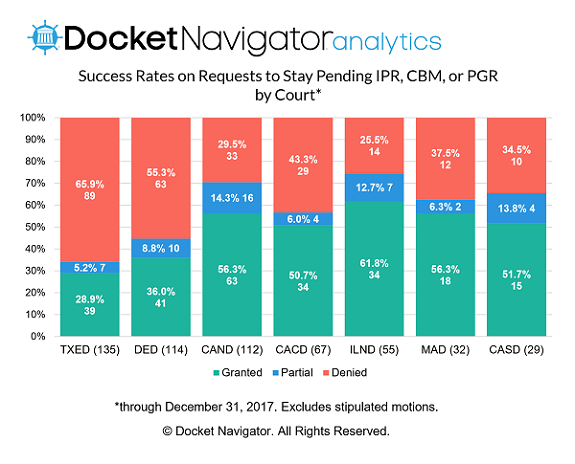 § 285 and rejected defendants' argument that the fees should be reduced by 33% on the ground that one of the patents-in-suit was found to be invalid as obvious because the hours billed were inextricably intertwined. "⁠[Plaintiff's] counsels’ work on 'unsuccessful claims was intimately related to the work done on successful claims.' Most of [plaintiff's] counsels’ time was 'devoted to the litigation as a whole, making it impossible to divide the work done on each individual claim.' The number of witnesses called at trial did not increase as a result of the unsuccessful claims. Further, all of [plaintiff's] claims were so closely related that allocating the amount of time spent litigating each individual claim would have been impossible." The court granted in part defendant's motion to exclude the testimony of plaintiff's technical experts because their application of the "designer of ordinary skill in the art" and "ordinary observer" standards to identify the relevant article of manufacture was improper. "The Court finds that there is no basis for importing these perspectives, which are used in the infringement and validity contexts, into the article of manufacture inquiry. Furthermore, the Court finds that introducing these perspectives risks confusing and misleading the jury. However, the Court declines [defendant's] request to exclude all of the material that [defendant] identified as related to these perspectives. . . . [M]uch of the DOSA-related testimony would be relevant and admissible if [the experts] instead testify to these points from their own perspectives as experts in industrial design and icon and graphical user interface design." Following a jury trial, the court denied defendants' motion for attorney fees under 35 U.S.C. § 285 because plaintiff's litigation positions and tactics as a whole were not exceptional. 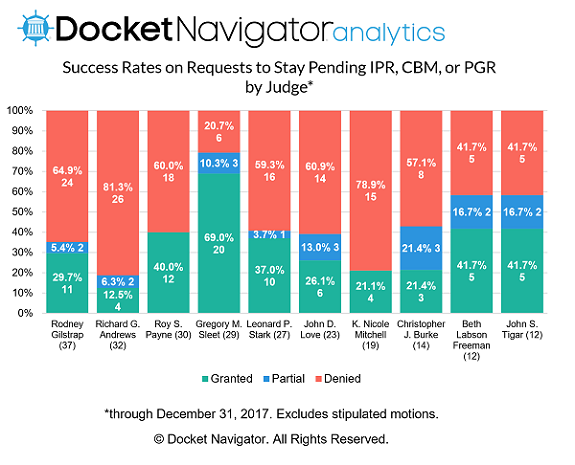 "Defendants’ strategy with its § 285 Motion seems to be to throw out as many different aspects of Plaintiff’s behavior as it can to support its fee request and 'see what sticks.' But it would be both tedious and wasteful for the Court to consider each and every individual tree when it should be looking at the landscape in the bigger forest. . . . And while perhaps true that Plaintiff had some shortcomings in its litigation and pre-litigation conduct and positions, the Court is unconvinced that those shortcomings amount to a showing that Plaintiff’s behavior was exceptional. . . . A party cannot simply hide under a rock, quietly documenting all the ways it’s been wronged, so that it can march out its 'parade of horribles' after all is said and done. That is the tenor of many of Defendants’ arguments here. Or alternatively, where Defendants did come forward at some point and challenged Plaintiff’s positions with some success, Defendants have not proven that they have been exceptionally wronged -- they got at least some of the relief they sought." Following a jury verdict of willful infringement, the court granted in part plaintiff's motion for enhanced damages because defendant's copying, lack of a good faith belief in noninfringement/invalidity, lack of closeness of the case, duration of misconduct, lack of remedial action, and motivation for harm favored an enhancement of $3.8 million on a $7.6 million award. "⁠[A]n attempted design around that ultimately fails to actually design around and is adjudged to be infringing necessarily copies where, as here, the adjudged infringer begins with a copy already existing technology and then proceeds to make changes. . . . [T]he record lacks any 'written evidence that anyone at [defendant] considered the full claim scope or alternative embodiments that might fall within it.'. . . [T]his case is one where the copying exhibited is 'so obnoxious as to clearly call for' 'discourage[ment] by punitive damage[s].' . . . [T]he jury awarded [plaintiff] approximately 90% of [its] proposed damages. . . . Although [defendant's] continued infringement lasted for 'only a year and eight months,' the Court must nonetheless weigh the period of time against [its] pre-suit notice and continued infringement. . . . [Defendant's] actions were preventative; they served to prevent expansion of the scope of the ongoing infringement as found at trial. . . . It is not 'good old-fashioned competition' to trespass upon other competitor’s property rights in pursuit of profits."